As bombs fell on London almost nightly from the autumn of 1940 through the summer of 1941, the lives of ordinary people were altered beyond recognition. A reclusive Oxford lecturer found himself speaking, not about Renaissance literature to a roomful of students but about Christian doctrine into a BBC microphone. A writer of popular fiction found herself exploring not the intricacies of the whodunit but the mysteries of suffering and grace. An erudite poet and literary critic found himself patrolling the dark streets and piecing together images of fire and redemption. C. S. Lewis, Dorothy L. Sayers, and T. S. Eliot became something they had not been before the war: bearers of a terrible, yet triumphant, message that people could not expect to be spared from pain and suffering, but they would be redeemed through pain and suffering. 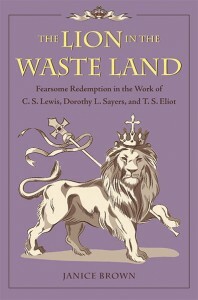 The Lion in the Waste Land initially explores the personal dynamic between these three writers and their misgivings about taking on the role of Christian apologist. Brown goes on to examine the congruency in their depictions of the nature of Christ, of conversion, and of angelic beings; and she highlights the similarity in their views of war and suffering, their portrayals of life as a pilgrimage to heaven, and their arguments for the value of walking in the “old paths” described in Scripture. Eliot depicted the world as a treacherous Waste Land where spiritual quests are fraught with disappointment and danger. Sayers recognized that the message of redemption through Christ is a thing of terror. Lewis’s Narnia books depicted the nature of Christ through the lion Aslan, who is good but not safe. Brown contends that the works of these three authors also offer hope in the midst of adversity, because they recognize that although redemption is a fearsome thing—like the image of a lion—it is also glorious. AuthorJanice Brown is a specialist in the work of Dorothy L. Sayers and also lectures on other writers of the Inklings milieu. She received her Ph.D. from Memorial University of Newfoundland and was professor of English Literature at Grove City College for 21 years. Her The Seven Deadly Sins in the Work of Dorothy L. Sayers (Kent State University Press, 1998) was a finalist for the Edgar Alan Poe Award. By considering Lewis, Sayers, and Eliot together, Janice Brown brings out something new about their work that is hard to define, but valuable and strangely moving. They differed from yet resembled one another, they supported and at times opposed one another, but they were pulling in the same direction, struggling to articulate their beliefs against the same moral, spiritual, and cultural headwinds. I read it as a literary and theological equivalent of Doris Kearns Goodwin’s Team of Rivals. Warmly recommended. —Michael Ward, University of Oxford, co-editor of The Cambridge Companion to C.S. Lewis.